Summary: Light, navigation, and keeping track of time — we’ve certainly found plenty of use for sun, moon, and stars. Sun and moon lift and lower the tides. And aside from all practical concerns, we enjoy the stars at night, the full moon, dawn and dusk, or sunrise and sunset for their sheer beauty. We should expect this, for Scripture says, “The heavens declare the glory of God, and the sky above proclaims his handiwork. (Psalm 19:1)” Yet nothing proclaims His glory like His crucified and risen Son — and God used the heavens to prophesy and to proclaim the Christ. Old Testament prophecy concludes with the promise of the coming “sun of righteousness” bringing “healing in its wings. (Malachi 4:2)” The Lord used a special star to lead the wise men to the Savior (Matthew 2:1-12). Jesus prophesied concerning the End Times in terms of the heavens and Scripture concludes with His declaration that He is “the bright morning star (Revelation 22:16)” heralding the dawn of eternity. Announced the King was nigh. To Christ the Morning Star. Gave way to conquered tomb. And it was so. And God made the two great lights — the greater light to rule the day and the lesser light to rule the night — and the stars. And God set them in the expanse of the heavens to give light on the earth, to rule over the day and over the night, and to separate the light from the darkness. And God saw that it was good. 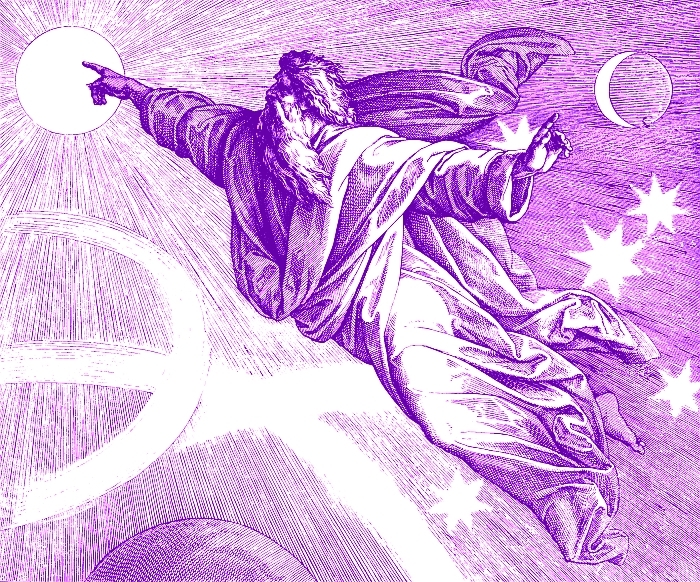 Audio: Click to hear the MP3 of In the (New) Beginning: Sun, Moon, and Stars. Illustration: The Fourth Day of Creation from Die Bibel in Bildern by Julius Schnorr von Carolsfeld at Wikimedia Commons.